Ripe sweet pears and creamy brie are a match made in heaven - especially when sandwiched inside a crisp, warm tortilla. 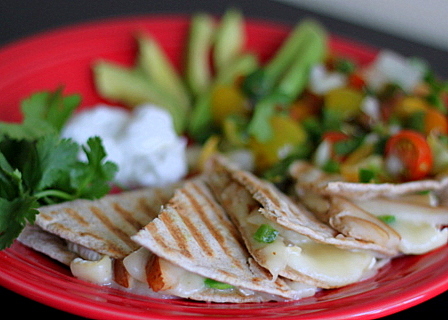 Quesadillas are one of my favorite weeknight dinners. They’re perfect for our carnivore/vegetarian household – throw a little meat in his, add some black beans and extra veggies to mine, dinner’s on the table in 20 minutes, and everyone’s happy. In this case, I went with the perfect sweet plus a little salty, tart plus creamy duo of Bosc pear slices and brie cheese (and no meat for my guy, because this ended up falling into the “so good who cares about meat?” category). 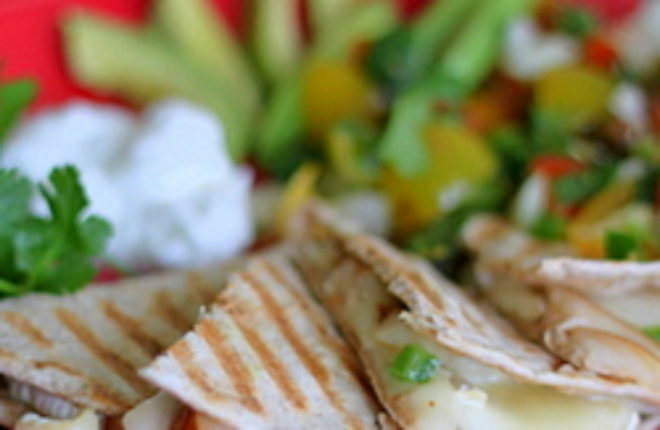 Sprinkled with some fresh jalapeno for a bit of bite, these quesadillas are a winner. Especially when paired with a perfect fresh salsa or even a tomato salad. Honestly, I’m not really sure what my side-dish concoction was so I’m not ready to post that recipe yet, but basically I took a bunch of heirloom cherry tomatoes, sliced them in half, added some onion, fresh cilantro, lime juice, and jalapeno. Pico di gallo? Tomato salad? Salsa? Pico de salad salsa? I have no idea. It’s pretty tasty, so I’ll share when I know. But back to my point. If you’ve never tried pears and brie together, please do it soon, even if it’s not in a tortilla. They’re seriously a match made in heaven. 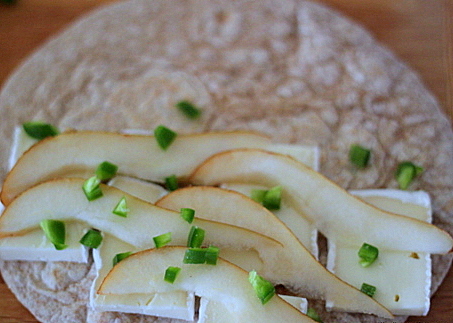 Lay the brie cheese and pear slices on one half of the tortilla. Sprinkle with the jalapeno peppers, if using. 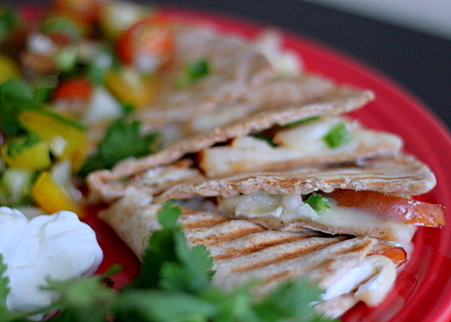 Fold the tortilla in half and cook in your panini press (my favorite method - no oil needed!) or, to cook in a frying pan, heat 1 - 2 teaspoons of vegetable or canola oil over medium heat. Lay the quesadilla in the pan and let cook for a minute or two until the cheese starts melting and the tortilla begins to brown. Flip and cook on the other side until cheese is melted and both sides are browned. Remove from panini press or frying pan, cut into wedges, and garnish with salsa, fresh sliced tomatoes, avocado, fresh cilantro, and/or sour cream. That sounds fabulous! I love brie in quesadillas! only one way to describe this (and the general pairing of brie and pairs)… YUM! Pear + brie = absolute heaven. 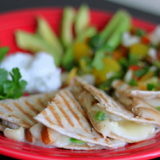 I love the idea of stuffing these two delicious ingredients into a quesadilla… looks great! Pear goes so well with strong cheese. This sounds like a wonderful combo and looks beautiful. I usually have pear with Gorgonzola so I really need to try some Brie. Great flavour combo for a quesadilla! I never thought to put the quesadillas in the panini press. Great idea. Can’t wait to try it!